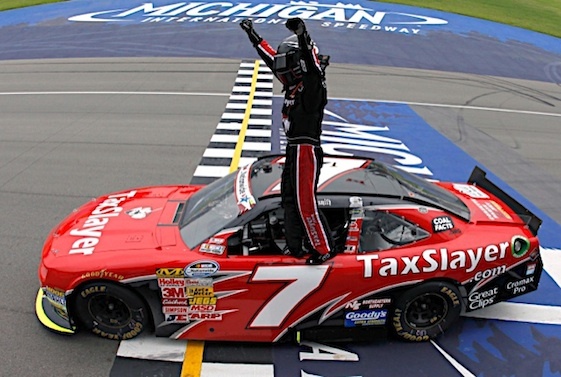 Nationwide Series points leader Regan Smith earned his second victory of the season Saturday by holding off Kyle Larson to win the Alliance Truck Parts 250 at Michigan International Speedway. Sprint Cup Series regulars Paul Menard, Kyle Busch and Trevor Bayne rounded out the top-five finishers. It was the second win of the season and fourth career series win for Smith, who also was first at Talladega in early May. Sam Hornish Jr., who started the day second in the standings, left the race on lap 81 after a piece of debris caused him to lose oil pressure. The race wasn’t quite a lap old before the first caution came out. Alex Bowman and Travis Pastrana spun in turn 4 before Brian Vickers crashed into Jeffrey Earnhardt. The latter two cars sustained significant damage. Vickers, seventh in the series points standings before the start of the race, got back on the track but finished 33rd. Dexter Stacey brought out the day’s second yellow flag when he struck the turn 3 wall on lap 7. 1. (20) Regan Smith, Chevrolet, 125, $45440. 2. (11) Kyle Larson #, Chevrolet, 125, $38200. 3. (2) Paul Menard(i), Chevrolet, 125, $24750. 4. (14) Kyle Busch(i), Toyota, 125, $17800. 5. (4) Trevor Bayne, Ford, 125, $23375. 6. (6) Brad Sweet, Chevrolet, 125, $21050. 7. (8) Chris Buescher, Ford, 125, $14810. 8. (19) Elliott Sadler, Toyota, 125, $21645. 9. (21) Nelson Piquet Jr. #, Chevrolet, 125, $20425. 10. (3) Brian Scott, Chevrolet, 125, $21875. 11. (10) Joey Logano(i), Ford, 125, $13975. 12. (7) Justin Allgaier, Chevrolet, 125, $19800. 13. (22) Jeremy Clements, Chevrolet, 124, $19550. 14. (5) Alex Bowman #, Toyota, 124, $19675. 15. (23) Cole Whitt, Toyota, 124, $20275. 16. (31) Mike Wallace, Chevrolet, 124, $19375. 17. (12) Travis Pastrana, Ford, 124, $19125. 18. (15) Johanna Long, Chevrolet, 124, $19075. 19. (17) Michael Annett, Ford, 123, $19025. 20. (1) Austin Dillon, Chevrolet, 123, $28550. 21. (28) Mike Bliss, Toyota, 123, $18900. 22. (25) Blake Koch, Toyota, 123, $18850. 23. (34) Scott Riggs(i), Ford, 123, $18800. 24. (24) Reed Sorenson, Chevrolet, 123, $18750. 25. (16) Parker Kligerman, Toyota, 123, $19175. 26. (29) Landon Cassill, Chevrolet, 122, $18625. 27. (36) Joey Gase, Toyota, 122, $12575. 28. (37) Eric McClure, Toyota, 120, $18500. 29. (27) Joe Nemechek, Toyota, 119, $18450. 30. (38) Juan Carlos Blum #, Chevrolet, 119, $18700. 31. (18) Jeffrey Earnhardt #, Ford, 85, $18350. 32. (13) Sam Hornish Jr., Ford, Engine, 81, $18305. 33. (9) Brian Vickers, Toyota, 80, $18260. 34. (35) Ken Butler III, Toyota, Ignition, 21, $18230. 35. (39) Carl Long, Ford, Alternator, 16, $12196. 36. (26) Jeff Green, Toyota, Vibration, 14, $11375. 37. (30) Josh Wise, Chevrolet, Electrical, 10, $11355. 38. (32) JJ Yeley(i), Chevrolet, Handling, 8, $11316. 39. (33) Dexter Stacey #, Ford, Accident, 6, $17190. Average Speed of Race Winner: 137.825 mph. Time of Race: 1 Hrs, 48 Mins, 50 Secs. Margin of Victory: 0.330 Seconds. Lap Leaders: A. Dillon 1-41; A. Bowman # 42-48; A. Dillon 49-68; J. Logano(i) 69-98; P. Kligerman 99-111; R. Smith 112-125. Leaders Summary (Driver, Times Lead, Laps Led): A. Dillon 2 times for 61 laps; J. Logano(i) 1 time for 30 laps; R. Smith 1 time for 14 laps; P. Kligerman 1 time for 13 laps; A. Bowman # 1 time for 7 laps. Top 10 in Points: R. Smith – 495; S. Hornish Jr. – 437; J. Allgaier – 436; A. Dillon – 428; E. Sadler – 424; B. Scott – 415; T. Bayne – 407; P. Kligerman – 405; K. Larson # – 403; B. Vickers – 395.